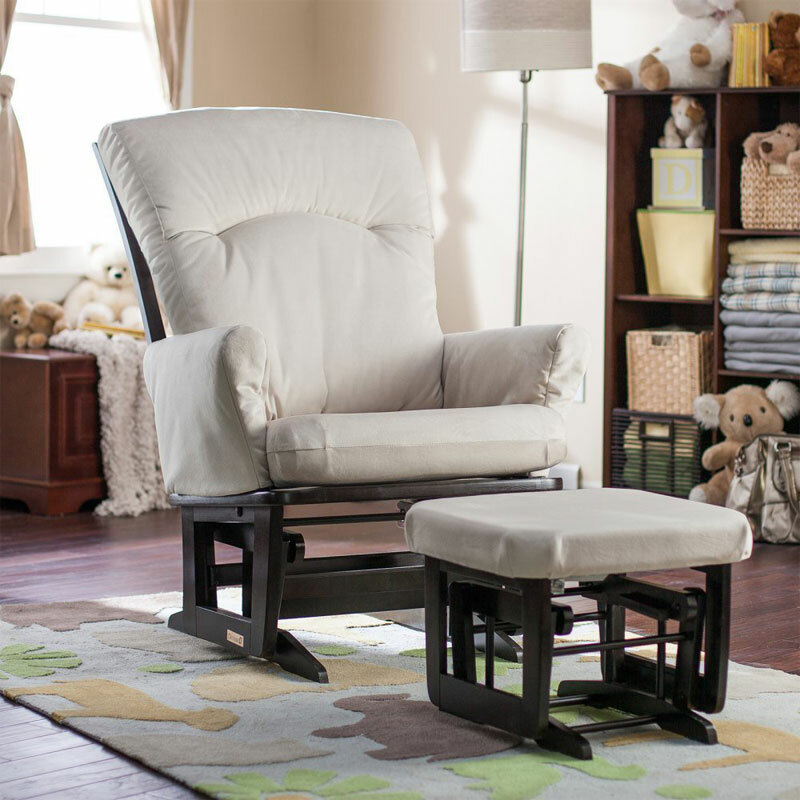 The Dutailier Modern Grande Platinum Glider and Ottoman is a premium nursery glider. 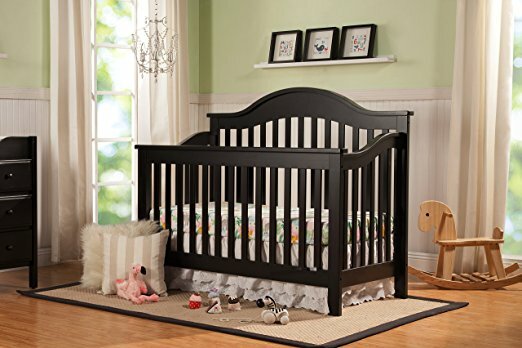 New parents are guaranteed to spend countless hours in the nursery with their newborn, including many sleepy hours at night. The need to be as comfortable as possible during this time hinges on finding a great nursery chair, but knowing what to look for can be daunting. 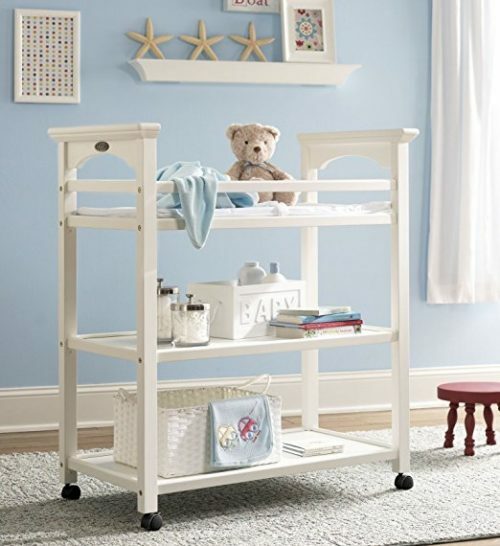 This article aims to help you zero in on the best chairs for your baby nursery. We’ll start by going over the main nursery chair styles and their differentiating features, then we’ll compare some of the best nursery chairs on the market. Okay, let’s overview the types of nursery chairs to consider. The most basic nursery chairs are simple standard rockers. 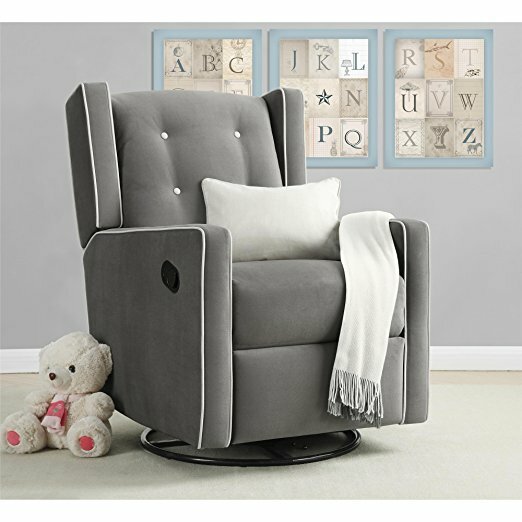 Nursery rocking chairs allow for a comforting forward and backward motion, but may not have other desirable features like recline ability or footrests. A step up from standard rockers are nursery gliders with ottomans. 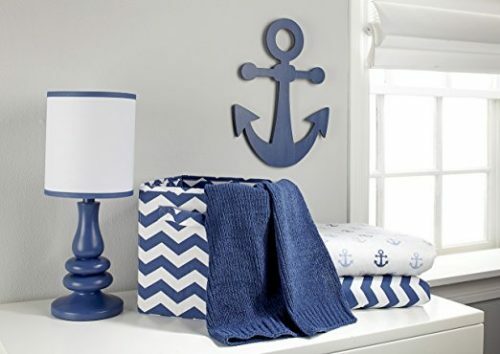 These sets are typically on the smaller side in the realm of nursery chairs, making them advantageous for use in smaller spaces. Glider chairs provide a smooth forward and backward motion similar to that of a rocking chair, while ottomans allow you to elevate your feet while you relax in the glider. Helpful tip, look for a set that includes an ottoman with a gliding mechanism. This allows for seamless gliding in the chair while your feet rest on the ottoman. The third common style of nursery chair is the swivel glider recliner. These chairs are a little more difficult to come across, but tend to be a popular choice among new parents because of their versatility. Swivel glider recliners tend to be bulkier than other styles of nursery chairs, but they allow you the ability to glide, recline, and swivel in one chair. Now that you have some basic knowledge on the main styles of nursery chairs, take a look at the comparison chart below to find an overview of some of the best nursery chairs currently available. The chart includes all three of the chair styles we’ve discussed so you can get a quick sense of which may be the best chairs for your baby nursery. Hopefully the comparison chart above is helpful in getting a sense of which chairs may be best for your nursery. Read on for a more in-depth look at a few of our favorite chairs from the table. Canadian company Dutailier has specialized in producing excellent wood gliders since 1977. 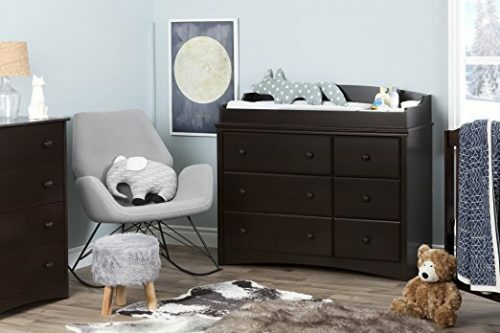 It’s no surprise then that the high-quality Dutailier Modern Grande Platinum Glider and Ottoman takes its place as one of the top chairs for your baby nursery. Unlike other sets, both the chair and the ottoman in this set feature a gliding mechanism. This enables both pieces to move in unison for a more relaxing experience. On top of that, premium ball bearing mechanisms are used to ensure a smooth gliding motion. 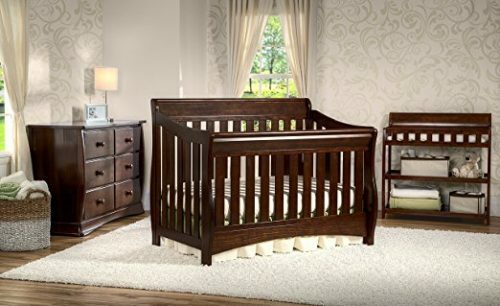 The major features that separate this nursery glider from the rest of the pack are the customization settings it affords. For starters, with this chair you can adjust both the seat and back height to optimally fit your body. The actual glide length is also adjustable so you can choose how far you move when in the chair. Perhaps most impressive, though, is the chair’s multiposition mechanism that allows you to lock your glider in six different stable positions. Whether you’re sitting with baby, reading, or watching TV, you can lock the chair into the most comfortable position for any given activity. The multiposition lock also conveniently holds the glider in place to make it easier to sit down on or get up from the chair. The cherry on top of this model is that the back actually reclines as well. You can recline up to 18 degrees, a perfect position for resting during a long night with your new baby. Both the glider and ottoman are built to last and feature all hardwood construction. The frames are polished in a beautiful, non-toxic espresso finish. Further, the frames are smooth-sanded to ensure there are no sharp edges to make the set as child-friendly as possible. The seat cushions, arms, and ottoman are all plushly padded and upholstered in a soft microfiber fabric. The glider measures 33 inches wide by 35 inches deep by 44 inches high, and the ottoman is 18 inches wide by 14.75 inches deep by 20 inches high. Okay, so this may be the cutest chair on our list, but it’s much more than just cute. The Baby Relax Mikayla Upholstered Swivel Gliding Recliner was made with nursery use in mind. Putting looks aside, lets go over the functionality of this model. It is a rare chair that combines swivel, gliding, and reclining motions into one, but in the Baby Relax Mikayla that is exactly what you get. That’s right, this chair falls in the coveted comfort trifecta category. The chair has a ball bearing mechanism that allows it to have a smooth rotating swivel and a smooth gliding motion for rocking. The seat is made from a spring core foam that provides extra back support. You can recline the chair partially or fully simply by pulling the small handle on the side of the chair. It is available in two soothing neutral colors, Gray and Mocha, perfect for inclusion in a nursery. White piping and button details ramp up the cute appearance of this chair as well. Adding to the aesthetic, the tufting and cushy look of the seat make this model seem exceptionally welcoming. Then, of course, the chair’s wingback shape adds another touch of style. The one real functional downside of this chair is that the footrest needs pushed down manually by the user’s legs after use, and it can be difficult to push down. This is especially not ideal for mothers who have had C-sections, so keep that in mind if you’re considering this option. 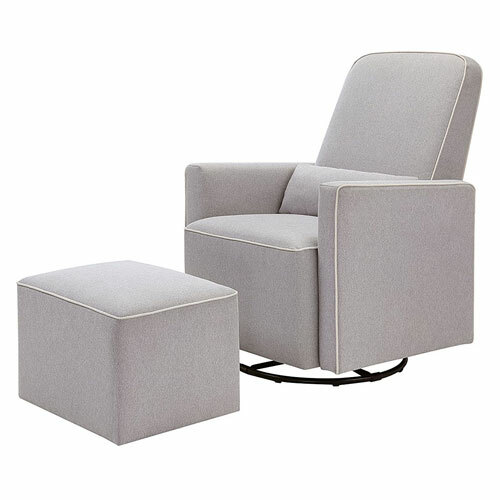 The DaVinci Olive Upholstered Swivel Glider is a bona fide mommy favorite. 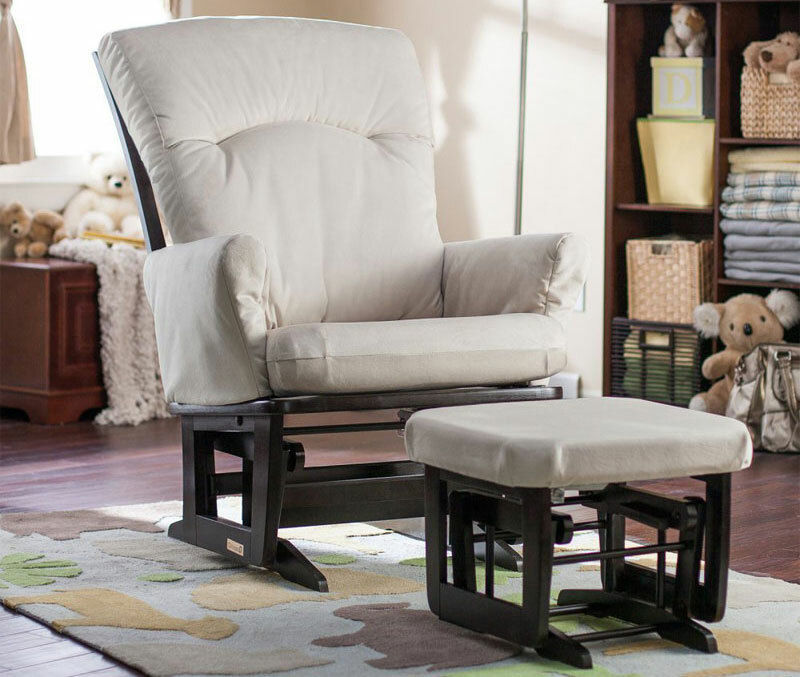 A common thread in reviews is talk of how comfortable this nursery glider is. Moms love the chair’s high back and that it provides overall great support. They also note that the chair’s arms are high enough to make for a good place to breastfeed. A bonus upholstered ottoman and a special lumbar pillow are both included with the purchase of the chair. Heathered polyester fabric is used for the upholstery, providing a soft and durable surface for each piece of the set. The chair’s base is made from a non-chemically-treated metal, and is designed to provide a smooth gliding motion as well as 360 degree swivel rotation. The chair is 36.5 inches wide by 29.5 inches deep by 41 inches high, and the ottoman measures 17 inches wide by 16 inches deep by 21 inches high. There are a couple of downsides to this set. Namely, the ottoman is stationary and therefore will not glide in synch with the chair. Another issue that moms brought up is that the angle of back of the chair is a little too far in a reclined lean, making it slightly uncomfortable to sit up straight in. That being said, overall the consensus is that this is one of the best nursery chairs in this price range.